The inner surfaces of your eyes contain photoreceptors—specialized cells that are sensitive to light and relay messages to your brain. There are two types of photoreceptors: cones (which are sensitive to color) and rods (which are more sensitive to intensity). You are able to “see” an object when light from the object enters your eyes and strikes these photoreceptors. Some objects are luminous and give off their own light; all other objects can only be seen if they reflect light into your eyes. However, humans can only see visible light, a narrow band of the electromagnetic spectrum (which also includes non-visible radio waves, infrared light, ultraviolet light, X-rays, and gamma rays). In terms of wavelengths, visible light ranges from about 400 nm to 700 nm. Different wavelengths of light are perceived as different colors. For example, light with a wavelength of about 400 nm is seen as violet, and light with a wavelength of about 700 nm is seen as red. However, it is not typical to see light of a single wavelength. You are able to perceive all colors because there are three sets of cones in your eyes—one set that is most sensitive to red light, another that is most sensitive to green light, and a third that is most sensitive to blue light. Some of you might be scratching your heads, asking, “Where is the Blue, Red, and Yellow model?” The artist color wheel (based in blue, red, and yellow) predates modern science and was discovered by Newton’s prism experiments. Scientifically, this does not adequately address the true range of spectral color. Upon discovering more about spectral color and how wavelengths work with surfaces (reflection/absorption) and the human eye, the blue-red-yellow model is shifting to the cyan-magenta-yellow model. We DO, however, still use the RBY model for mixing paints, and it is the most common color wheel students will typically find in art stores. Red, green, and blue are the primary colors of light—they can be combined in different proportions to make all other colors. For example, red light and green light added together are seen as yellow light. This additive color system is used by light sources, such as televisions and computer monitors, to create a wide range of colors. When different proportions of red, green, and blue light enter your eye, your brain is able to interpret the different combinations as different colors. Color is transmitted through transparent media. All colors added together = white. The absence of light = true black. 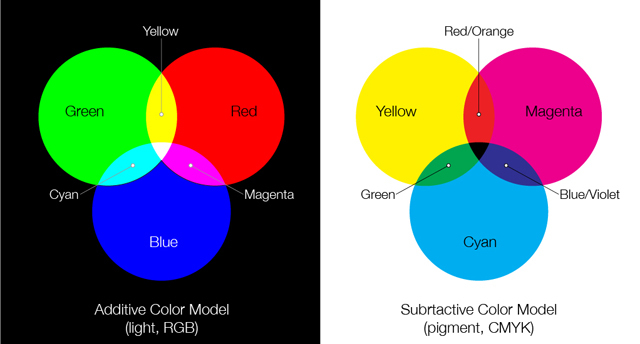 IMPORTANT: Note that when RGB’s primaries are mixed evenly that they create the secondary colors of our next color model, CMY (cyan, magenta, and yellow)! However, there is another set of primary colors with which you may be more familiar. The primary colors of pigment (also known as subtractive primaries) are used when producing colors from reflected light; for example, when mixing paint or using a color printer. The primary colors of pigment are magenta, yellow, and cyan (commonly simplified as red, yellow, and blue). Pigments are chemicals that absorb selective wavelengths—they prevent certain wavelengths of light from being transmitted or reflected. Because paints contain pigments, when white light (which is composed of red, green, and blue light) shines on colored paint, only some of the wavelengths of light are reflected. For example, cyan paint absorbs red light but reflects blue and green light; yellow paint absorbs blue light but reflects red and green light. If cyan paint is mixed with yellow paint, you see green paint because both red and blue light are absorbed and only green light is reflected. These primaries are ultimately derived from the RGB model as secondary colors. The main reason they are promoted to having their own color model is because it is from CMY that we can create all other printable colors. Remember that, ultimately, without the existence of RGB light wavelengths, we would see nothing. Color is absorbed by and reflected off of media. Because these colors are achieved via reflection, we assume a pure white ground as the base filter for pure colors. All colors added together = near black. While most printers recognize this model as the standard pigment model, the traditional artist Color Wheel substitutes Blue as the Cyan primary and Red as the Magenta primary, resulting in slightly different secondary and tertiary results. NOTICE: The colors in RGB appear slightly more brilliant than in CMYK. This can be attributed to the difference between the mode of transmitting light vs. absorbing/reflecting light off of surfaces. ***Download the PDF diagram and explanation of the Additive and Subtractive Color Models here.